New high-performance nonetchable ceramics, such as alumina and zirconia are becoming common indirect restorations. Zirconium-oxide all-ceramic materials have high strength and biocompatibility that permit their use as core material for all-ceramic crowns and fixed partial denture. However, the surface stability of zirconia makes it difficult to establish durable chemical and mechanical bonds with this material. Hydrofluoric acid etching combined with silanization, which is used with other glass-ceramic materials, was not successful with acid-resistant and glass-free zirconia. A few luting agents, such as multistep methacryloyloxydecyl dihydrogen phosphate (MDP) monomer-based resin cements, have demonstrated satisfactory bonding to zirconium-oxide ceramics. In vitro artificial aging techniques have been proposed to accelerate the degradation of the resin-dentin interface and hence enable the measurement of the long-term bonding and durability of dental materials. Thermocycling in an aqueous environment is widely used to simulate mechanical fatigue in the wet oral environment. Although some prior research found that thermocycling decreased bond strength to zirconia, contrary results have also been reported. 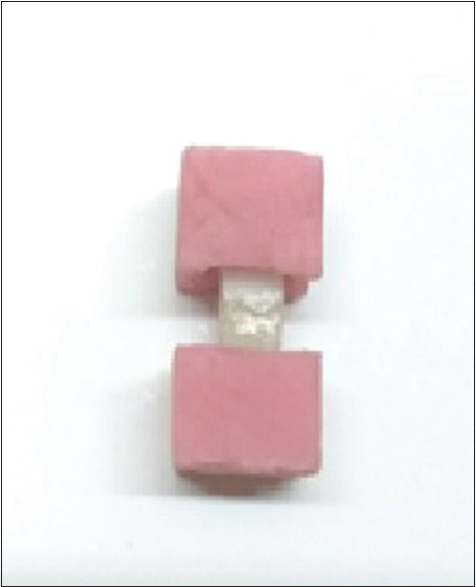 Hence, this study evaluated the bond strength between zirconia and resin block, bonded with two different resin cements before and after thermocycling. Bond strength of zirconia and resin blocks bonded with self-adhesive resin cement and nonphosphate monomer cement after thermocycling. 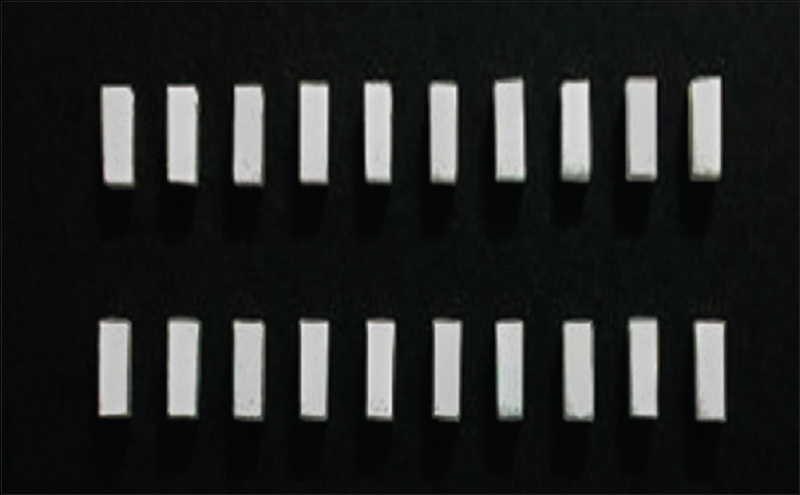 Twenty stabilized zirconium-dioxide specimens (5 mm × 5.4 mm × 13 mm) were produced using a metal mold [Figure 1] and [Figure 2]. The metal mold was sprayed with an illuminant and then scanned with three-dimensional scanner (Amman Girrbach ceramill map 360) and it was processed by a CAD-CAM milling machine (Amman Girrbach ceramill motion 2) to manufacture an exact zirconia specimen required for the micro-tensile bond strength testing. 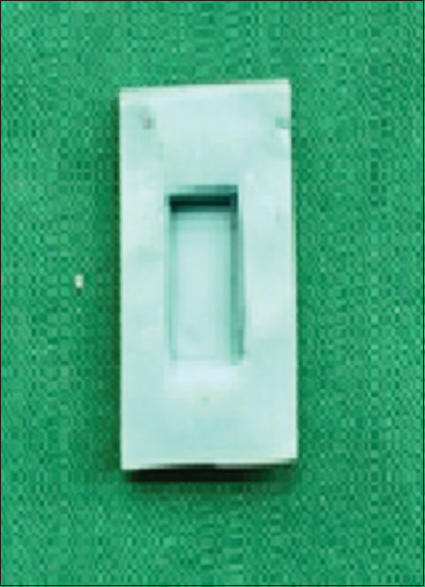 Each zirconium block was duplicated in a light-curing resin material specimen (Swiss Tec-light curable composite resin) (5 mm × 5.4 mm × 13 mm) using a mold made of addition silicon impression material (Kerr-Take 1 Advanced Putty) [Figure 3]. Resin layers were incrementally condensed into the mold to fill it completely and each layer was light polymerized for 40 s (SmartLite Max LED-curing light Dentsply). Twenty such specimens were prepared one for each zirconium block [Figure 4]. The zirconium specimens and resin specimens were then divided into two groups of n = 10 each [Figure 5]. 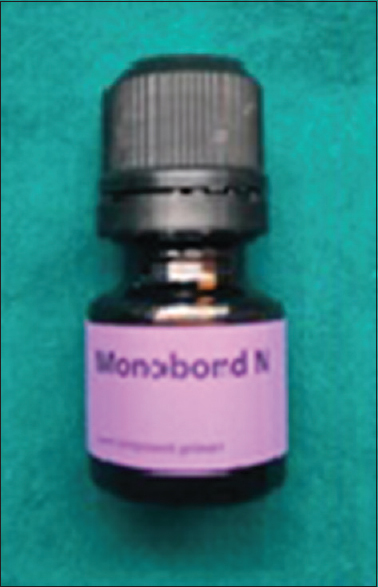 The surface of zirconium specimen of one group (Group 1) was treated with application of zirconia primer agent (Monobond N) [Figure 6] and other group (Group 2) was not treated with any special surface conditioning. 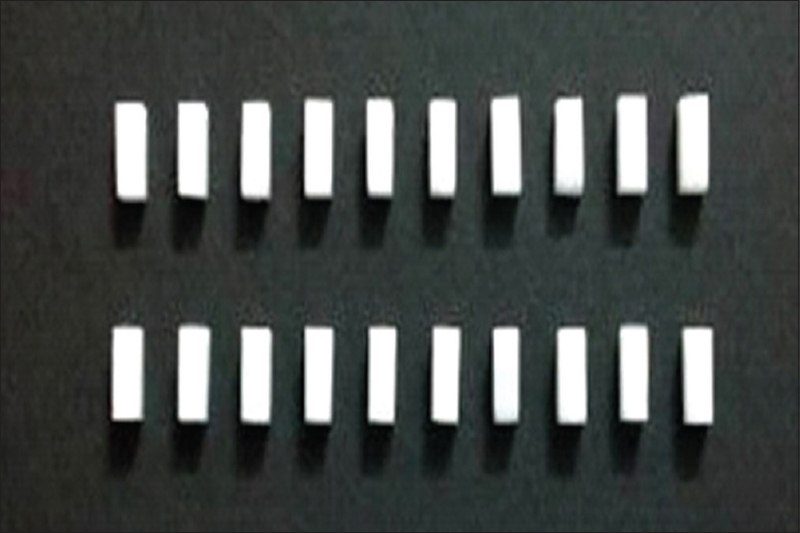 A single coat of primer was manually applied with the help of an applicator tip and gently air-dried after 20 s.
After surface conditioning, Group 1 blocks were bonded with the resin block using a self-adhesive resin cement (phosphate monomer cement) (Multi-link) and Group 2 blocks were bonded with resin blocks using a nonphosphate monomer cement (Relyx) in standard room temperature. Luting procedures were carried out under a constant load of 750 g. After initial self-polymerization, 40 s of light irradiations (SmartLite Max LED-curing light Dentsply) from each side of the blocks were performed to ensure optimal polymerization [Figure 7]. Samples were stored in an airtight container with packs of silica gel to prevent moisture contamination before the testing being carried out. The specimens in each group were further subdivided into two subgroups of n = 5 each. The A sub group from each group is then subjected to thermocycling (6000 cycles) in deionized water from 5°C to 55°C, with a 30 s dwelling time and 5 s transfer between temperature baths [Figure 8]. They are then followed by testing for tensile strength in Instron universal testing machine. The B subgroup specimens were directly tested for tensile bond strength without being subjected to thermocycling [Figure 9]. 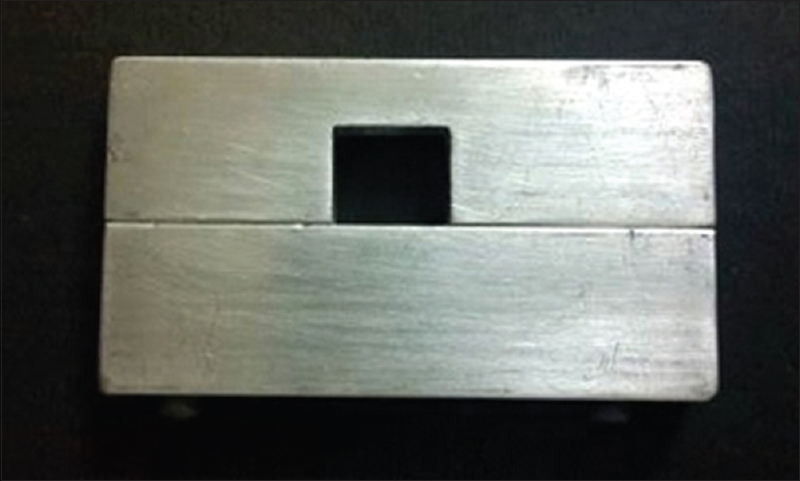 As the test sample was small for the universal testing machine to hold, an acrylic block was customized. 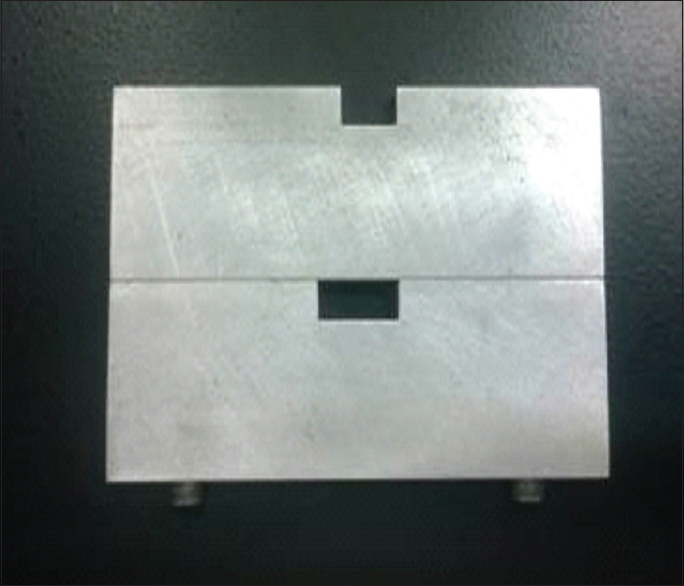 It was done using a jig [Figure 10] where the acrylic was poured into the slot of the jig and the samples were held until it sets [Figure 11]. 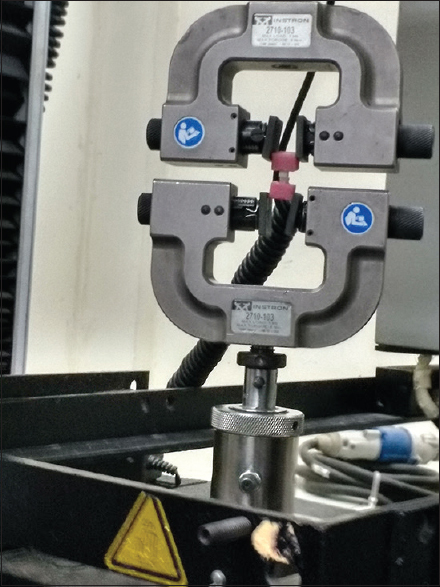 The tensile bond strength was evaluated using a computer controlled universal testing machine (Instron universal testing machine) [Figure 12]. All specimens were fixed to the machine and held by means of the acrylic fabricated from the jig and stressed to failure at a crosshead speed of 0.5 mm/min. The point of fracture between zirconia and the veneered blocks were digitally recorded, and reading was statistically analyzed using one-way ANOVA and post hoc multiple comparisons were performed using the Tukey test. The mean tensile bond strength for the zirconia-resin specimen bonded with nonphosphate monomer cement (RELY-X) without thermocycling (Group 2B) was 4.16 Mpa [Table 1]. This mean bond strength was the highest when compared to the bond strength of the other groups evaluated in this study. The mean bond strength of the Group 1B (3.57 mpa) was lesser than the mean bond strength of 2B (4.21 mpa). After thermocycling the highest mean bond strength was seen in the Group 1A (3.45 mpa) [Table 1]. This bond strength was higher than that of the bond strength of the group cemented with nonphosphate monomer cement (3.35 mpa) (Group 2A). Significant difference is seen in the bond strength (P < 0.05) between the nonphosphate group with or without thermocycling (Group 2A and B). Even though there was no significant difference between Group 1A and 1B, there was a decrease in bond strength value after thermocycling. 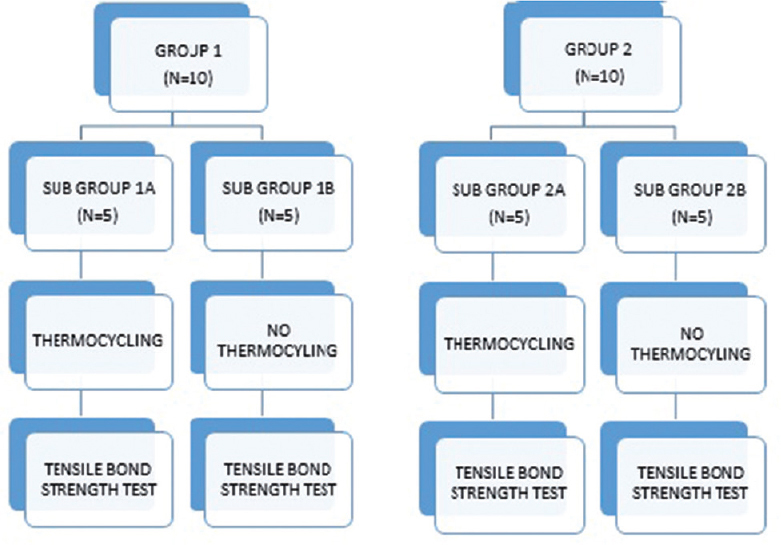 Independent sample t-test between Group 1A (MLA-Thermocycled) and 1B (MLA-Nonthermocycled) showed no significant difference in bond strength between the two groups [Table 2]. Independent sample t-test between Group 2A (RELY-X–Thermocycled) and 2B (RELY-X-Nonthermocycled) showed a significant difference in bond strength between the two groups [Table 3] and [Table 4]. Multiple comparisons made with one-way ANOVA with Tukey post hoc test showed a significant difference (P ≤ 0.05) between Group 2A (RELY-X-Thermocycled) and 2B (RELY-X-Nonthermocycled). No significant difference was seen in multiple comparisons made between other groups [Table 5]. The mean tensile bond strength for Groups 1 and 2 irrespective of the sub groups was 3.51 and 3.75 mpa, respectively [Table 6]. Independent sample t-test for Group 1 and 2 showed no significant difference in two-tailed values (0.310 and 0.312, respectively) [Table 7]. The surface-adhesive primers created covalent bonding to zirconia and helps in propagating zirconia's use in clinical dentistry. A ceramic primer or resin cement, which contains a bio-functional monomer, 10-methacryloyloxydecyl dihydrogen phosphate (MDP) is the most widely used. Phosphate monomers form chemical bonds with the zirconia surface and have resin terminal ends that bond to the resin cements. MDP is the most time-tested of the commonly used phosphate monomers and has been shown to have a special affinity for nonglass-based substrates of zirconia, alumina, and metal. Long-term water storage and thermal cycling are the conditions most often used to test the durability of resin bonds. Both tests are considered clinically relevant aging parameters.,, Thermocycling in an aqueous environment is widely used to simulate mechanical fatigue in the wet oral environment. Temperature changes produced by thermocycling apply mechanical stresses to interfaces between dissimilar materials through differential expansion and contraction. Resin cement/ceramic bonded interfaces are susceptible to degradation. Challenging these bonding sites at the laboratory is required to test the bond stability of different luting systems proposed for oxide-based ceramics. 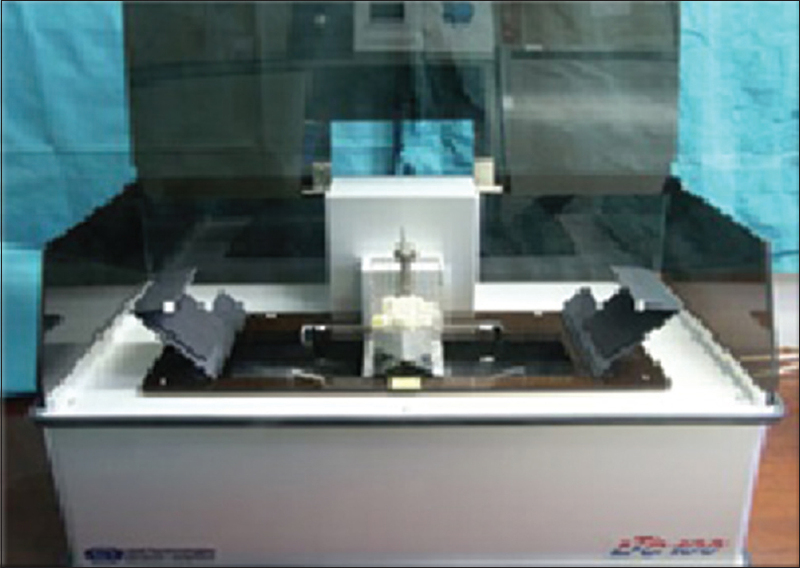 A micro-tensile test was performed since it allows for a homogenous distribution of stress across the adhesive interface and a sensitive evaluation of the bond strength. In the nonaged groups, the bond strength of the RELY-X group were significantly higher than that of the MLA group (1B vs. 2B). After thermocycling, the tensile bond strength values of the MLA group were considerably higher than that of the RELY-X group. Thermocycling significantly decreased bond strength in the RELY-X group. Initially, under dry condition, the nonphosphate monomer group (RELY-X) had a better bond strength than that of the group cemented with phosphate monomer-containing cement (MLA). However, this does not have much clinical significance as the oral environment is not so pristine and hence, more thorough assessment of bond strength in the functional environment is needed to be assessed. After thermocycling (1A vs. 2A), the highest mean bond strength was seen in MLA group (Group 1A). This bond strength is higher than the RELY-X group (Group 2A). This shows that durability of the bond decreases when subjected to thermocycling. A phosphate monomer cement should be preferred as they have comparatively less depreciation in their bond strength after thermocycling. This is of more clinical significance, as thermocycling simulates mechanical fatigue in the wet oral environment. This is more in relevance to the actual clinical condition as the crown cemented in the oral cavity would be subjected to condition similar to those done artificially by thermal ageing. These varying results may be due to differences in the monomer composition, initiator and solvent between the two types of dual-cured resin cements. The nonphosphate cement group (RELYX) after thermocycling showed greater affinity of the cement adhered predominantly on the resin specimen than on the zirconia. This shows degradation of the bond strength of the cement from zirconia following thermocycling. Whereas the phosphate monomer-containing cement (MLA) showed the same bond stability to zirconia before and after thermocycling. This shows that when subjected to thermocycling better bond stability is seen in phosphate monomer-containing cements. In the present study, the influence of thermocycling significantly affected bond strength in the RELY-X group. Resin cement selection seems to be a more relevant factor in bonding to zirconia. The adhesive potential of MDP to zirconia depends on the presence of a passive coating of zirconium oxide on the ceramic surface. The MDP containing self-adhesive resin cement (MLA) is more suitable to bond the zirconia surface than other self-adhesive cement. Resin cement selection seems to be a more relevant factor in the bonding of zirconia. The phosphate monomer-containing cement (MLA) has the better bond strength after thermocycling compared to the nonphosphate monomer cement (RELYX) group. Thermocycling reduced the bond strength of both the groups and a significant difference was seen in the bond strength of nonphosphate monomer cement (RELY X) group subjected to thermocycling compared to the nonthermocycled one. 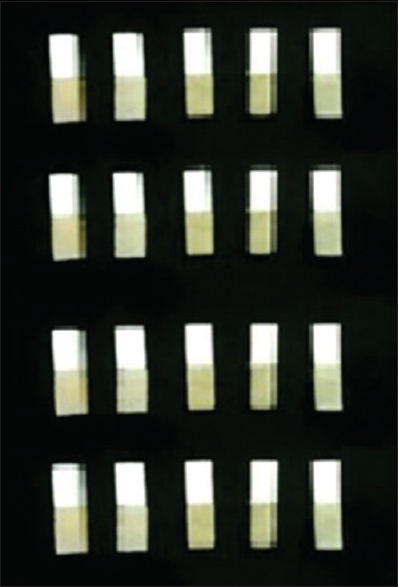 Hence, for long-term durability, luting of zirconia with a phosphate monomer-containing cement after the zirconia has been surface treated is preferable as their bond strength did not show much significant difference after being subjected to thermocycling, compared to the nonthermocycled group. Tensile bond strength values were significantly affected by the luting agent system and thermal aging. D'Amario M, Campidoglio M, Morresi AL, Luciani L, Marchetti E, Baldi M, et al. Effect of thermocycling on the bond strength between dual-cured resin cements and zirconium-oxide ceramics. J Oral Sci 2010;52:425-30. Blatz MB, Sadan A, Martin J, Lang B.In vitro evaluation of shear bond strengths of resin to densely-sintered high-purity zirconium-oxide ceramic after long-term storage and thermal cycling. J Prosthet Dent 2004;91:356-62. Heikkinen TT, Lassila LV, Matinlinna JP, Vallittu PK. Thermocycling effects on resin bond to silicatized and silanized zirconia. J Adhesion Sci Technol 2009;23:1043-51. Ozcan M, Nijhuis H, Valandro LF. Effect of various surface conditioning methods on the adhesion of dual-cure resin cement with MDP functional monomer to zirconia after thermal aging. Dent Mater J 2008;27:99-104. Aguiar TR, André CB, Correr-Sobrinho L, Arrais CA, Ambrosano GM, Giannini M, et al. Effect of storage times and mechanical load cycling on dentin bond strength of conventional and self-adhesive resin luting cements. J Prosthet Dent 2014;111:404-10. Peumans M, Hikita K, De Munck J, Van Landuyt K, Poitevin A, Lambrechts P, et al. Bond durability of composite luting agents to ceramic when exposed to long-term thermocycling. Oper Dent 2007;32:372-9. Griffin JD Jr., Suh BI, Chen L, Brown DJ; FAGD. Surface treatments for zirconia bonding: A clinical perspective. Can J Restorative Dent Prosthodont 2010;3:23-9. Aboushelib MN, Ghoniem M, Mirmohammadi H, Salameh Z. General principles for achieving adequate bond to all ceramic restorations. J Dent Oral Hyg 2009;1:36-41. Murahara S, Minami H, Kurashige H, Hori S, Sakoguchi K, Onizuka T, et al. Bond Strength of Self -adhesive Resin Cements to Zirconia. Toronto: IADR Meeting; 2008. Ana P, Ruxandra S. Adhesive cementation protocol of zirconia restorations. Rom J Oral Rehabil 2011;3;114-9..
Bailey LF, Bennett RJ. DICOR surface treatments for enhanced bonding. J Dent Res 1988;67:925-31. Atta MO, Smith BG, Brown D. Bond strengths of three chemical adhesive cements adhered to a nickel-chromium alloy for direct bonded retainers. J Prosthet Dent 1990;63:137-43. Chang JC, Powers JM, Hart D. Bond strength of composite to alloy treated with bonding systems. J Prosthodont 1993;2:110-4. Osorio R, Castillo-de Oyagüe R, Monticelli F, Osorio E, Toledano M. Resistance to bond degradation between dual-cure resin cements and pre-treated sintered CAD-CAM dental ceramics. Med Oral Patol Oral Cir Bucal 2012;17:e669-77. Betamar N, Cardew G, Van Noort R. Influence of specimen designs on the microtensile bond strength to dentin. J Adhes Dent 2007;9:159-68. Bottino MA, Valandro LF, Scotti R, Buso L. Effect of surface treatments on the resin bond to zirconium-based ceramic. Int J Prosthodont 2005;18:60-5. Oyagüe RC, Monticelli F, Toledano M, Osorio E, Ferrari M, Osorio R, et al. Effect of water aging on microtensile bond strength of dual-cured resin cements to pre-treated sintered zirconium-oxide ceramics. Dent Mater 2009;25:392-9. Lin J, Shinya A, Gomi H, Shinya A. 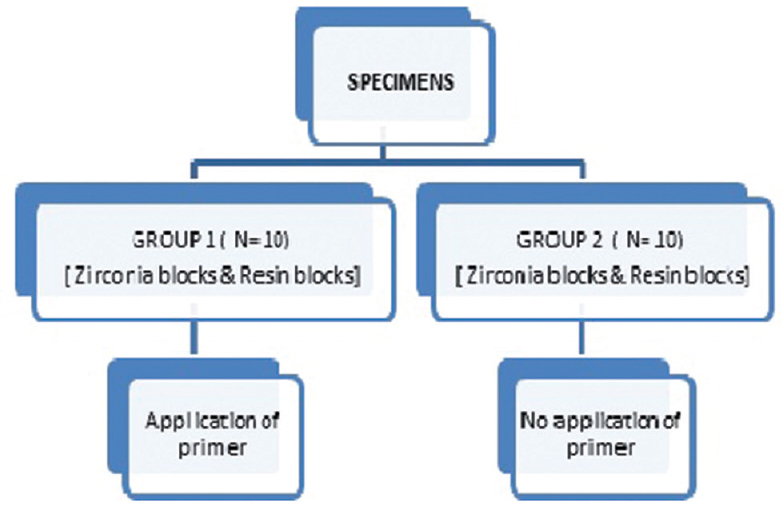 Effect of self-adhesive resin cement and tribochemical treatment on bond strength to zirconia. Int J Oral Sci 2010;2:28-34. Lüthy H, Loeffel O, Hammerle CH. Effect of thermocycling on bond strength of luting cements to zirconia ceramic. Dent Mater 2006;22:195-200. Braden M, Causton EE, Clarke RL. Diffusion of water in composite filling materials. J Dent Res 1976;55:730-2. Kern M, Thompson VP. Bonding to glass infiltrated alumina ceramic: Adhesive methods and their durability. J Prosthet Dent 1995;73:240-9. Hummel M, Kern M. Durability of the resin bond strength to the alumina ceramic procera. Dent Mater 2004;20:498-508.